Today, Ben announced the fourth grant of the 2013-14 season from The Ben Roethlisberger Foundation at The Giving Back Fund. The Foundation will be distributing a grant to the Sacramento Police Department, northeast of Oakland, where the Steelers will play the Raiders on Sunday, October 27th. 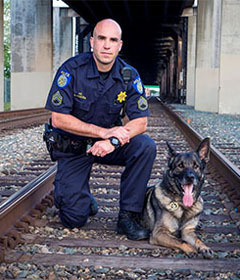 Sacramento PD plans to apply the grant to the purchase and training of a new dog, K-9 Rex. Rex is a 17-month-old Belgian Malinois that will be teamed up with Officer Aaron Thompson. During the 2013-14 NFL season, The Ben Roethlisberger Foundation will be distributing grants to K-9 units of police and fire departments in the cities and surrounding communities of each regular season away game for the Steelers. The Foundation will also distribute several grants to the Pittsburgh area and will consider a grant to a non-NFL market city in the United States for each playoff game in which the Steelers compete. The foundation invited police and fire departments across the country to submit proposals detailing their needs. This marks the seventh season that the Ben’s foundation has distributed grants to K-9 units. Their mission is to support K-9 units of police and fire departments throughout the United States with a particular emphasis on support for service dogs in Pittsburgh, PA.
Ben and the Foundation also strive to support Make-A-Wish. *That’s Sgt. Oliveira and his K9 partner Sig in the photo above.